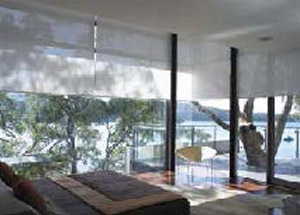 Thousands of fabrics are available, including translucent mesh fabrics, light filtering and complete blockout. Mesh fabrics are available with hole sizes 3%, 5% and 10% of the area of the fabrics. Quality fabrics from Belgium, France and the United States. Some of the cheaper fabrics give off a plastic odour and do not hang or cut very well. 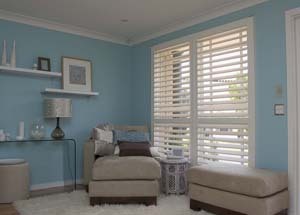 The blind is supplied with a quality roller system for reliability and ease of operation. Day & Night System. In the daytime when standing outside the home looking at the window when a mesh fabric is used it is virtually impossible to see into the home while from inside you can see out. However at night the reverse happens. To get around this problem of privacy we add another blockout roller blind to the rear of the system which can be pulled down whenever required. 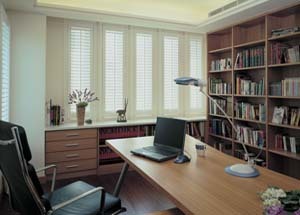 Reduces glare but still allows light to penetrate and the ability to see outside. 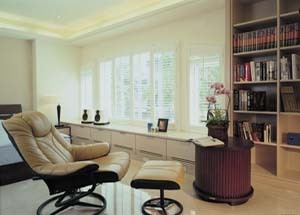 one-third to reduce sky glare and let your eyes relax while at home.